* The following simulation is testing how well a 2 stage quantile regression can work. The example is a little unlikely but the methods should still be good. * In the first stage we will assume the coefficient on the instrument is constant. * In the second stage we will assume that the coefficient on the endogenous variable w is changing in y. * The properties of quantile regression are difficult because of the non-linearities involved in median maximization. * However, we can test the properties of 2 stage quantile regression through simulation! * Imagine we would like to estimate how good are weapons are at killing zombies. * However you are afraid that people who own weapons might also be more militaristic people and in general might be more effective at killing zombies. * Therefore, you would like to instrument for the likelihood of owning a weapons. * You would like to know three things. * 1. For the bottom 25% zombie killer how much does owning weapons improve their ability to kill zombies? * 2. For the median person (typical person), how much does owning weapons improve zombie killing ability? * 3. 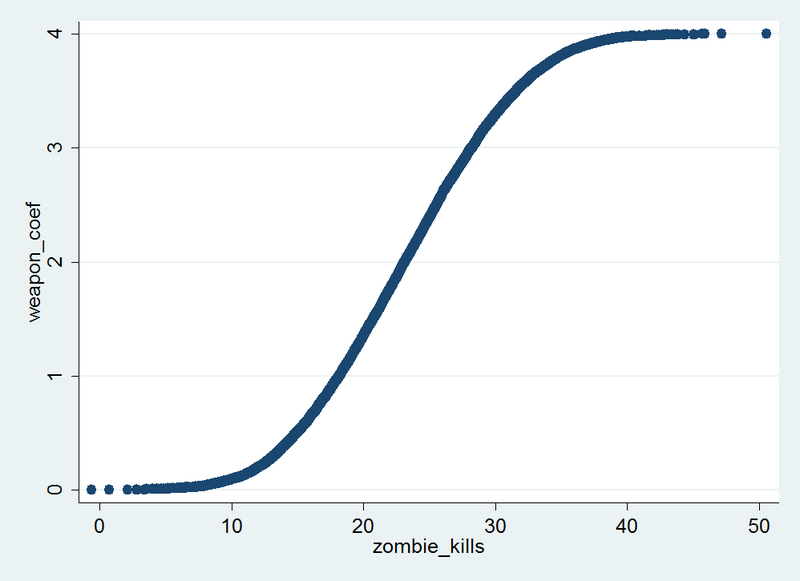 For the top 75% zombie killer how much does owning weapons improve their ability to kill zombies? * Your instrument is that some people live in areas that are more weapon friendly prior to the zombie outbreak. label var weapon_ease "The ease by which people can purchase weapons in the area"
* Assume the likelihood of people being militaristic is unrelated to the area the live (unlikely). * Note partial kills are possible because assists do not count as full kills. * We can see that at all levels weapons appear far more effective than they actually are. * It appears that 2SQreg while not perfect is much better than qreg. * We can see that while the estimates of 2SQreg is identical to that of the control function they both appear to be effective methods. How do you obtain ivqreg. The findint ivqreg command does not work. This post shows several methods of constructing a ivqreg command by hand. I think if you read though it, it might make sense.